Growing up, there was a restaurant nearby that I went to all the time called Fusion Land. It specialized in cuisine that was both Asian and American inspired – hence the “fusion” in the name. My favorite dish was the teriyaki chicken burger – baked chicken smothered in teriyaki sauce, sandwiched in between a piece of crunchy lettuce and a fluffy bun. It was so good! Though the restaurant is now closed, I still love the idea of fusion cuisine. 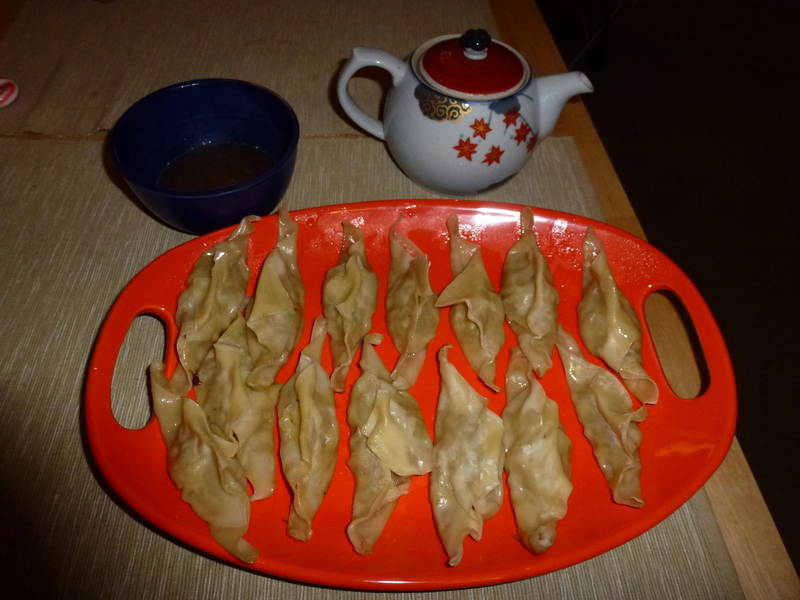 Here is a recipe for the perfect Asian-American fusion meal: French Onion Soup Potstickers. Yes, you heard that correctly… French onion soup in potsticker form! It’s the best of both worlds! I’ve tried this recipe a few times and they’ve come out great every time. First, take 1 jumbo sweet onion. Cut it in half, then cut each half in half, then thinly slice each quarter. 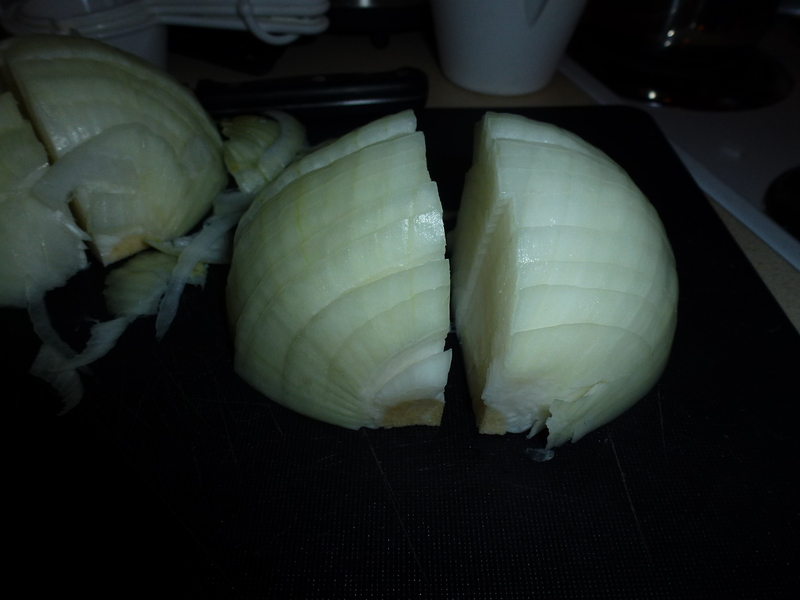 The original recipe called for 2 jumbo sweet onions, but I could only fit one in my pan! 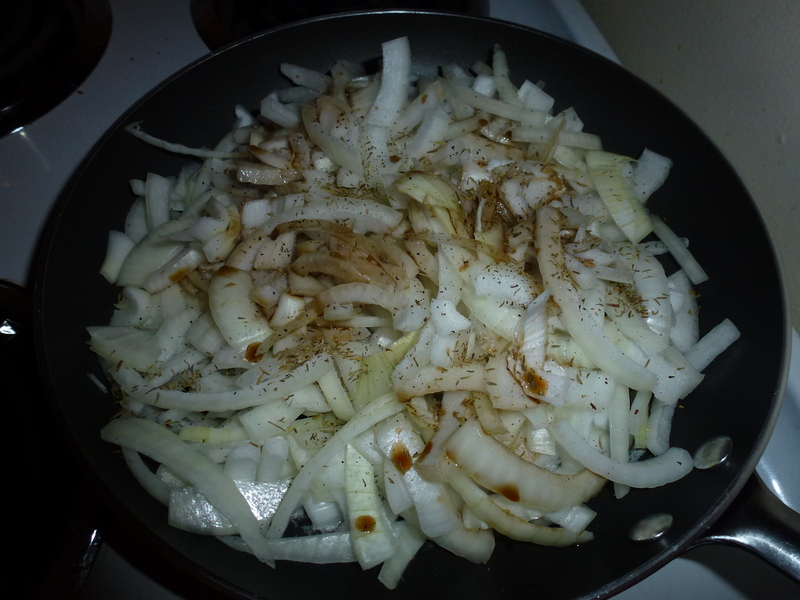 Even with 1 jumbo onion (those sweet onions are huuuuuge!) 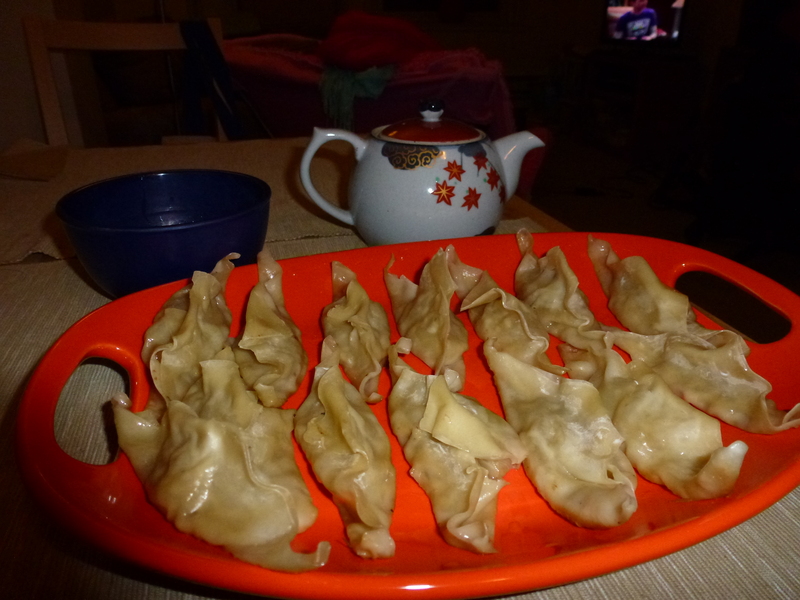 I still made over 20 potstickers. But feel free to add another onion if your pan is big enough. 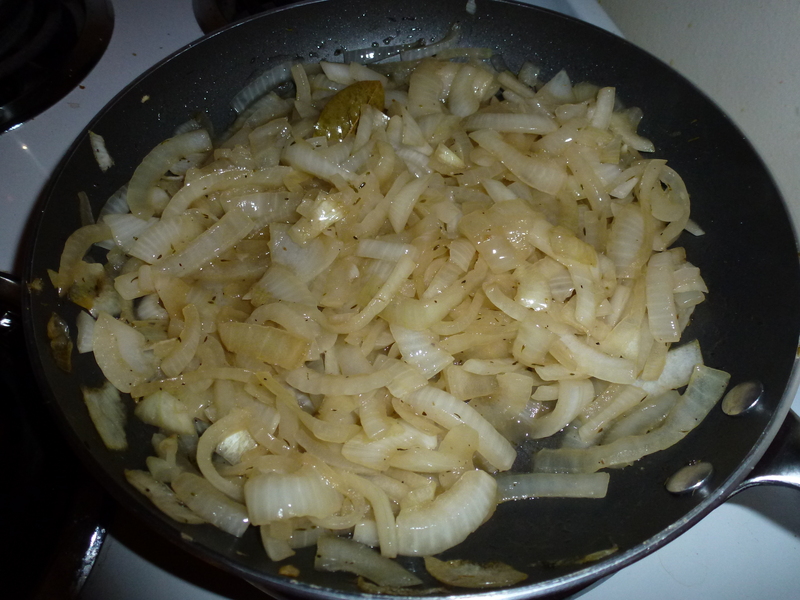 Add the onions into a large skillet with 1 tablespoon butter and 1 tablespoon extra virgin olive oil. Season with salt and pepper and cook over medium heat. Next, add 1 tablespoon Worcestershire sauce, 1/4 teaspoon dried thyme, 1 big bay leaf or 2 small ones, and 1 teaspoon sugar. Finally, pour in 1/2 cup beef broth. Turn the heat up to high and bring the broth up to a boil. 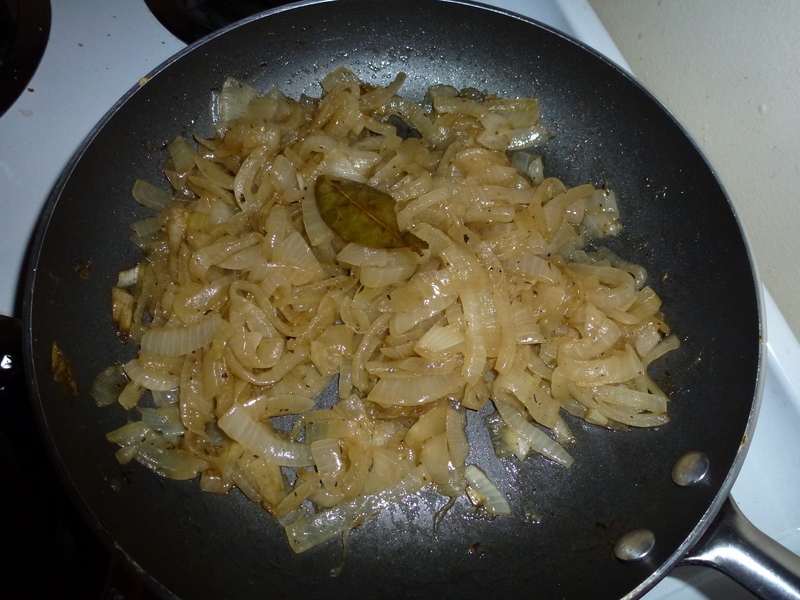 Then bring the heat back down to medium and let the onions cook, stirring occasionally. I cooked mine for about 30 minutes. 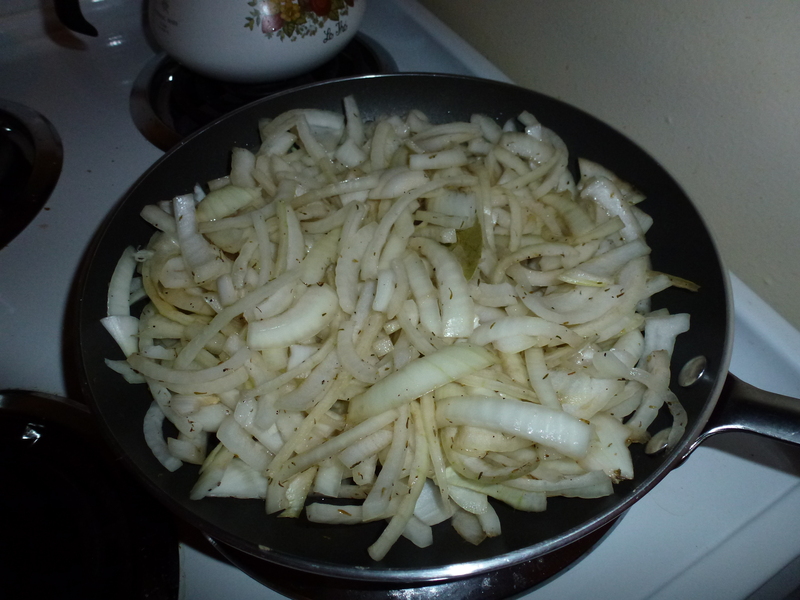 My best advice for cooking these onions is to leave them alone! Stir them occasionally to make sure they don’t get stuck to the skillet, but other than that just let them do their thing. Once the onions are soft enough, turn off the heat and let them cool down. 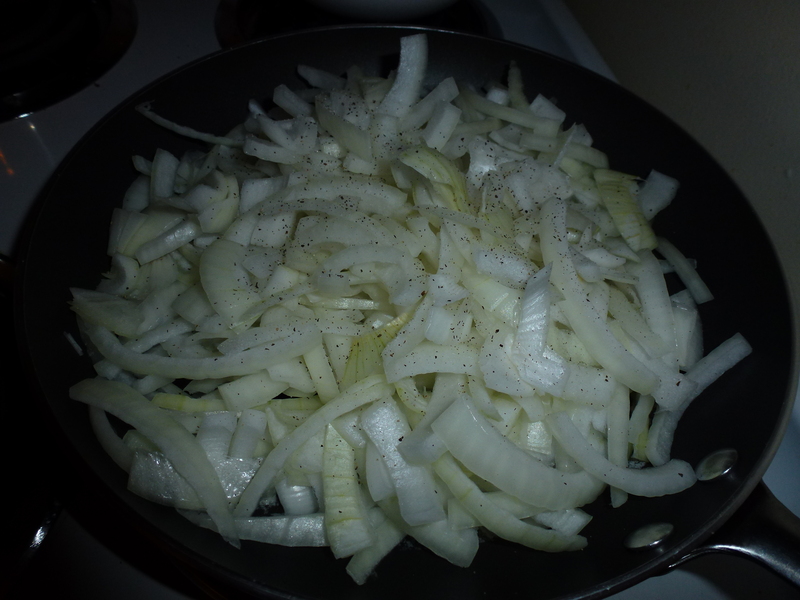 In a bowl, mix the cool onions with 1 cup finely grated gruyere cheese. Now that the filling is done, get your potsticker station ready. 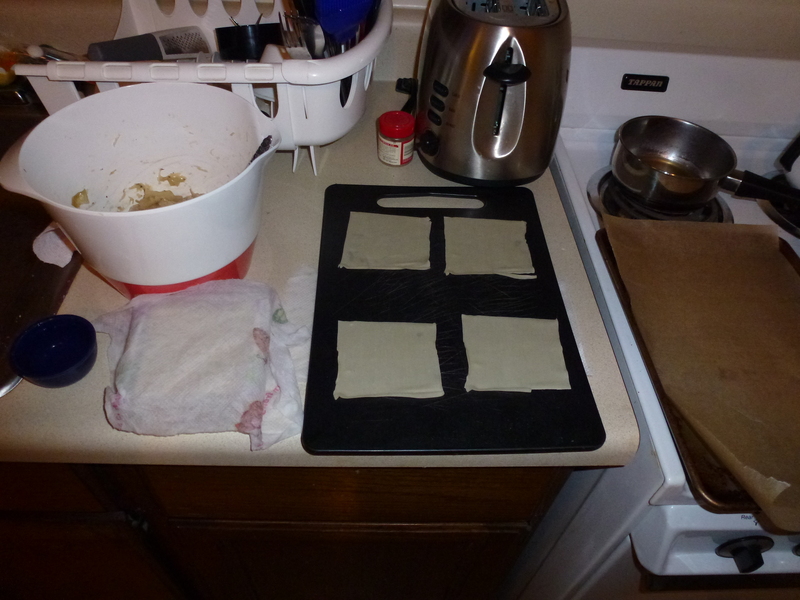 You’ll need a package of wonton wrappers, a clean surface, a small bowl of water, and a wax paper-lined baking sheet. 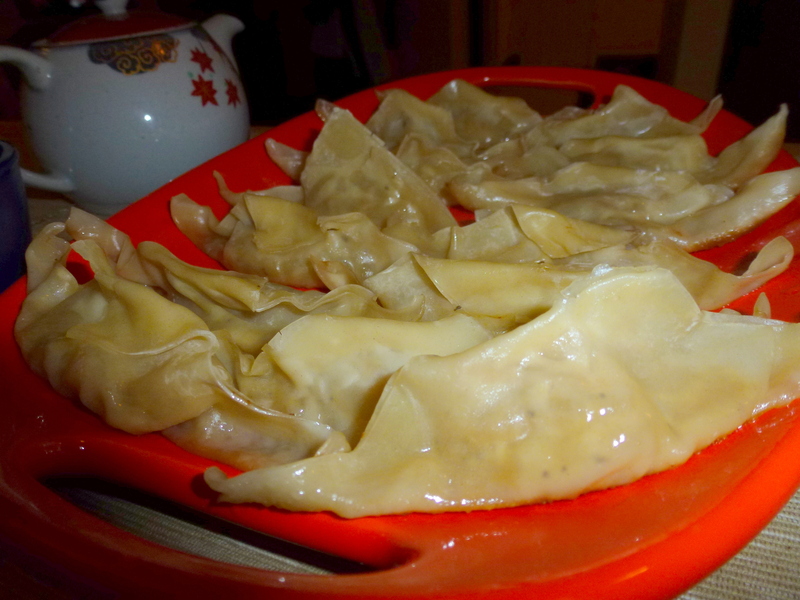 Cover your wonton wrappers with a squeezed out wet paper towel so that they don’t dry out while you are working. You won’t use all the wrappers for this recipe, so you can freeze the wrappers for later or use them for other recipes – they work really well to make ravioli! 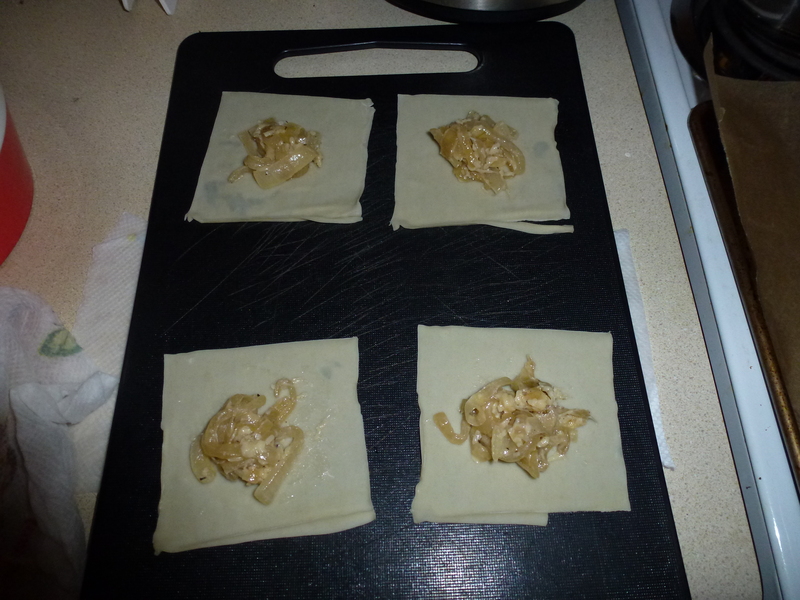 Lay out 4 wontons and place 1 tablespoon of the onion filling onto each one. 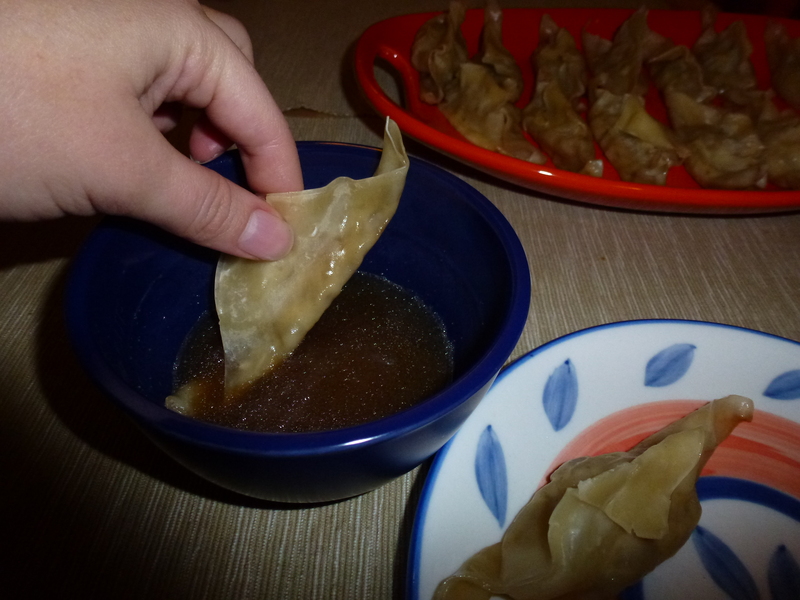 Wet your finger in the bowl of water, then use it to wet each edge of the wonton wrappers. Take 1 corner of the wrapper and fold it up to meet the opposite corner. 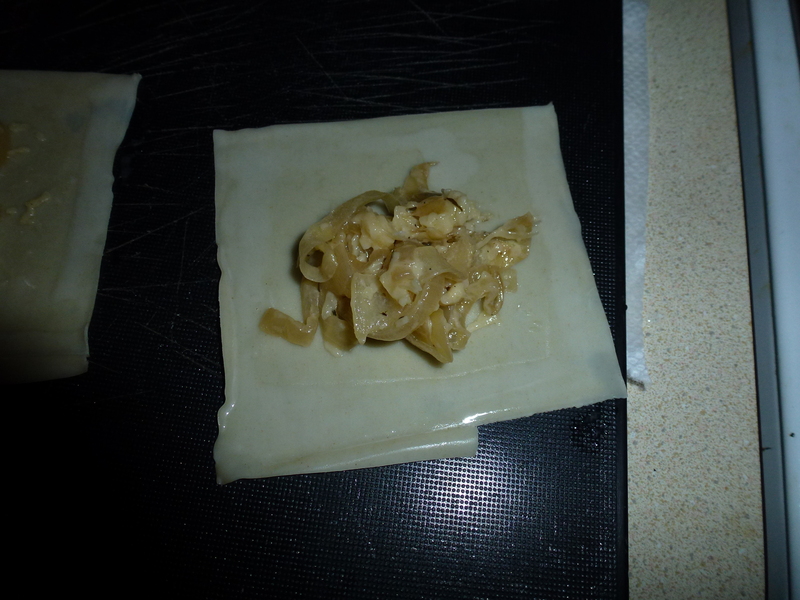 Press the edges tightly to seal the potsticker and make sure not to trap any air inside. 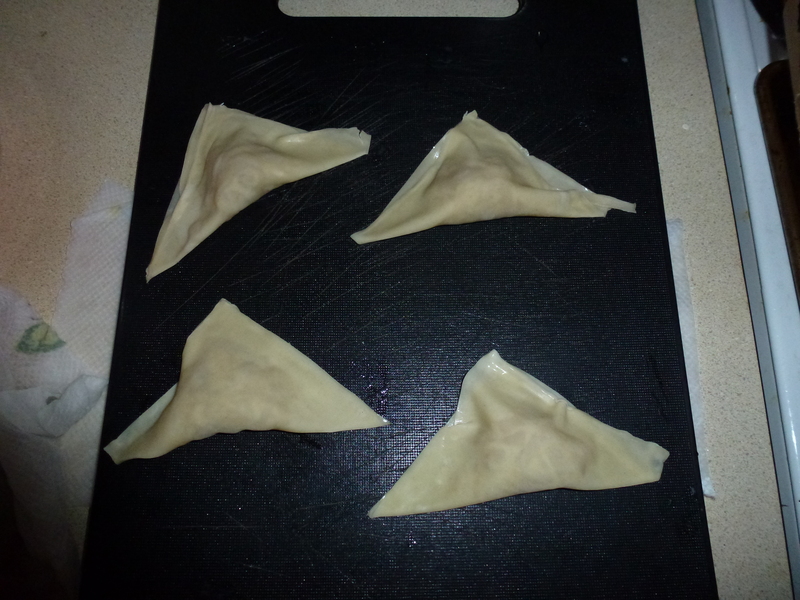 Place the completed potstickers onto the baking sheet, pressing down gently to create a flat bottom. At this point, you can either freeze the potstickers for later, or cook them immediately. To freeze: place them in the freezer on the baking sheet then once they harden, transfer them into a freezer-safe bag or container. 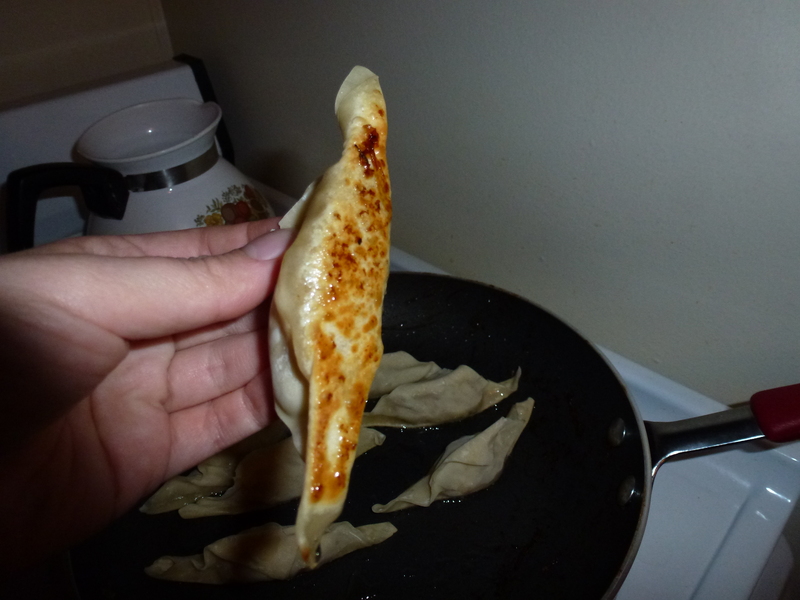 The frozen potstickers cook exactly the same as the non-frozen ones – no need to thaw! To cook: In a large skillet heat 1 tablespoon vegetable oil over medium-high heat. Add potsickers into the skillet making sure not to overcrowd them so they don’t stick together. 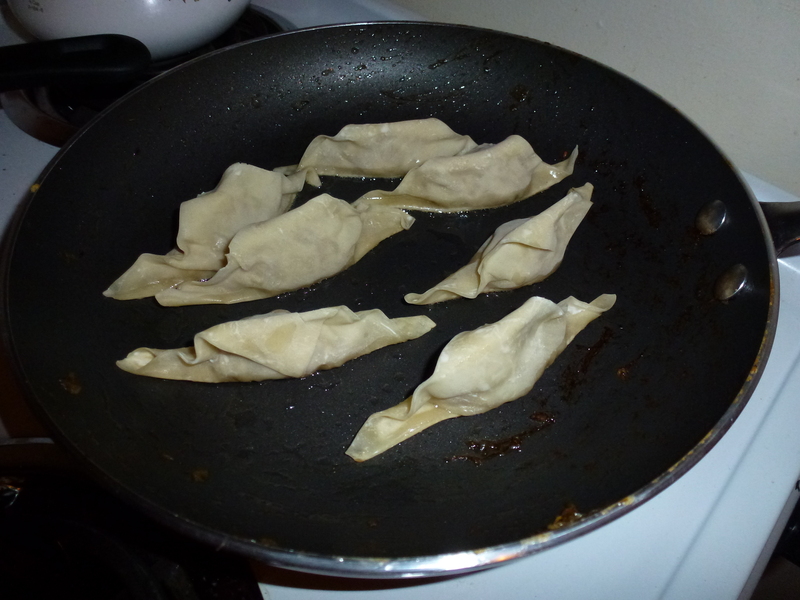 Cook the potstickers until the bottoms are golden brown (about 2 minutes). 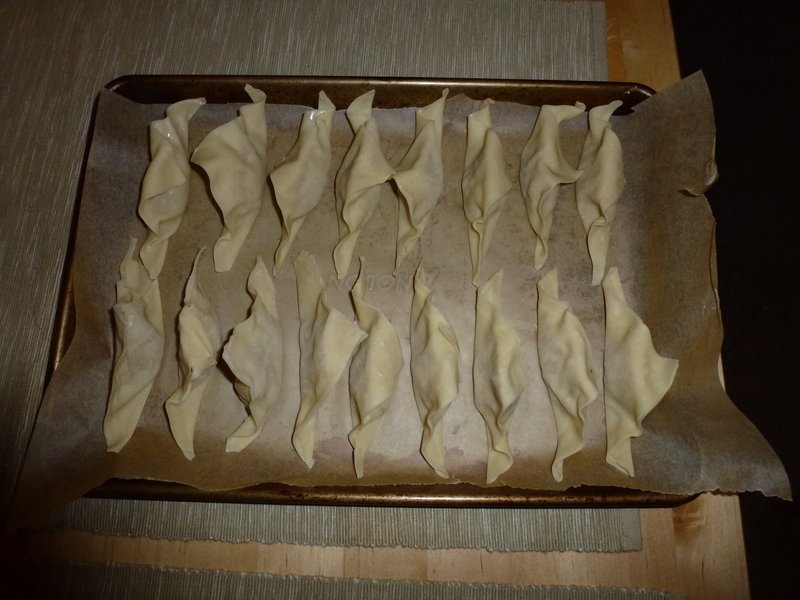 Next, add about 1/3 cup of water, or enough to come 1/3 the way up the potstickers. Immediately place a lid on the skillet and steam for about 2 minutes or until the potstickers are translucent and there’s just a little bit of water left. 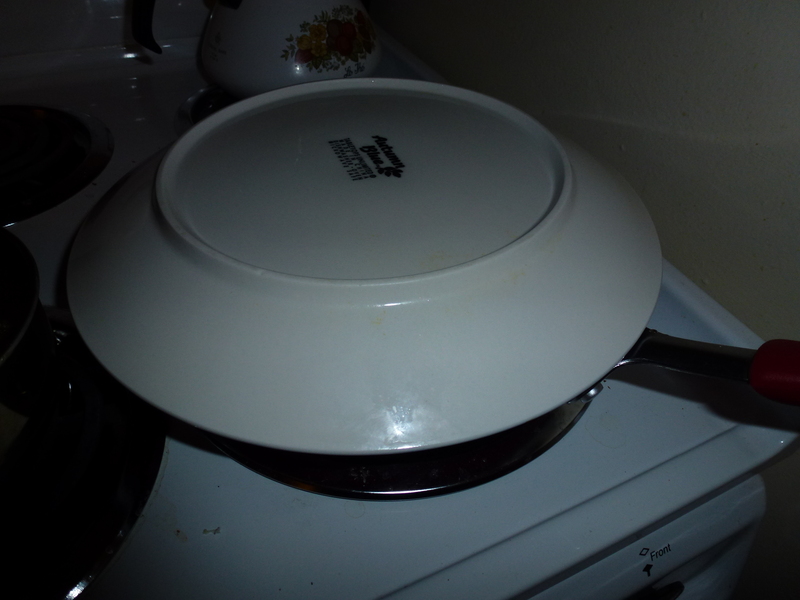 As you can see, I do not have any lids that fit my skillets (the woes of being a twentysomething in a tiny apartment with random kitchen utensils) so I used a plate and it worked just fine. Remove the lid to let all the water cook out and let the bottoms of the potstickers crisp back up. About 30 seconds. Remove the potstickers with a spatula and heat up the “au jus” dipping sauce – 1/2 cup beef broth, 1 teaspoon worcesterchire sauce, a dash of garlic powder and a sprinkle of salt. 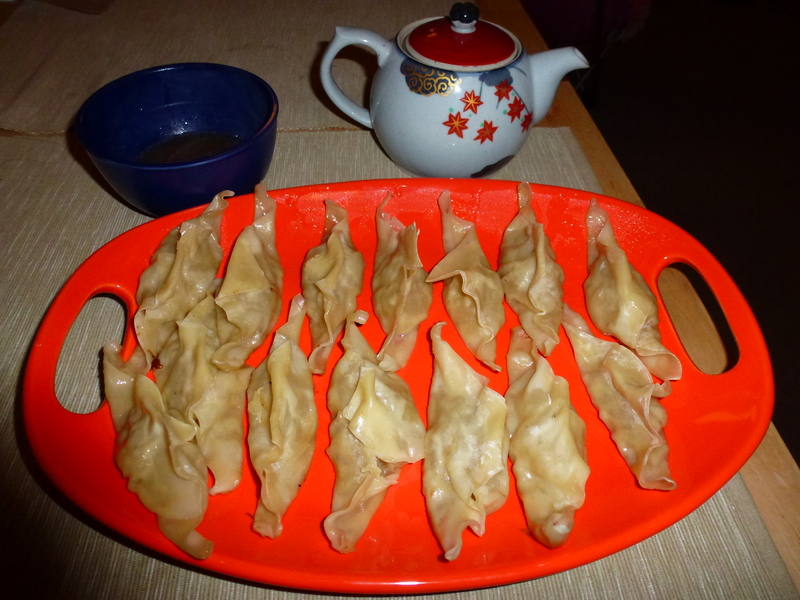 The nice thing about this recipe is that the potstickers freeze well so you can freeze them and use them for a quick dinner later. You don’t even need to thaw them to cook them – just pop ’em right into the pan frozen. So convenient! Recipe adapted from iowagirleats – this girl is a recipe genius! Heat butter and oil in a large skillet over medium heat. Add onion slices and season with salt and pepper, then add Worcestershire sauce, dried thyme, bay leaves, sugar, and beef broth to the skillet and stir well. Turn heat up to high, bring broth to a boil, then turn back down to medium heat. 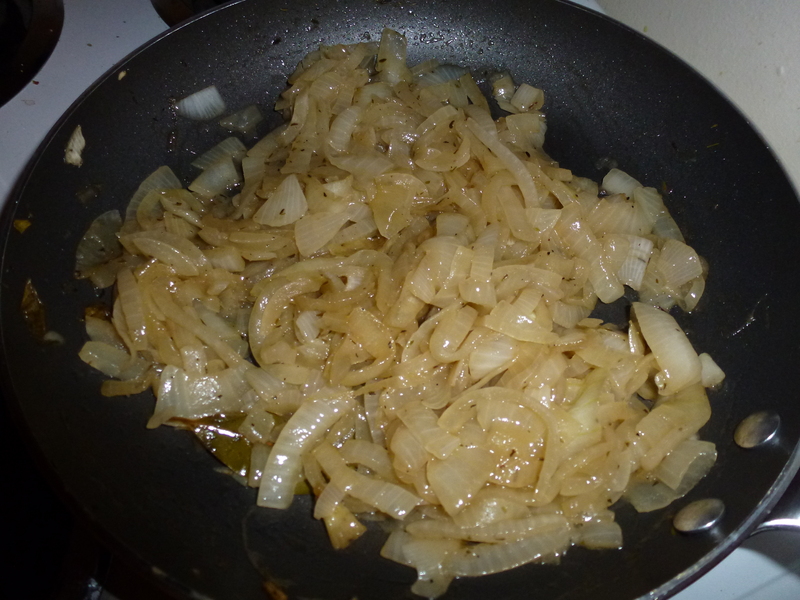 Cook onions, stirring occasionally, until very soft and dark brown. About 30 minutes. 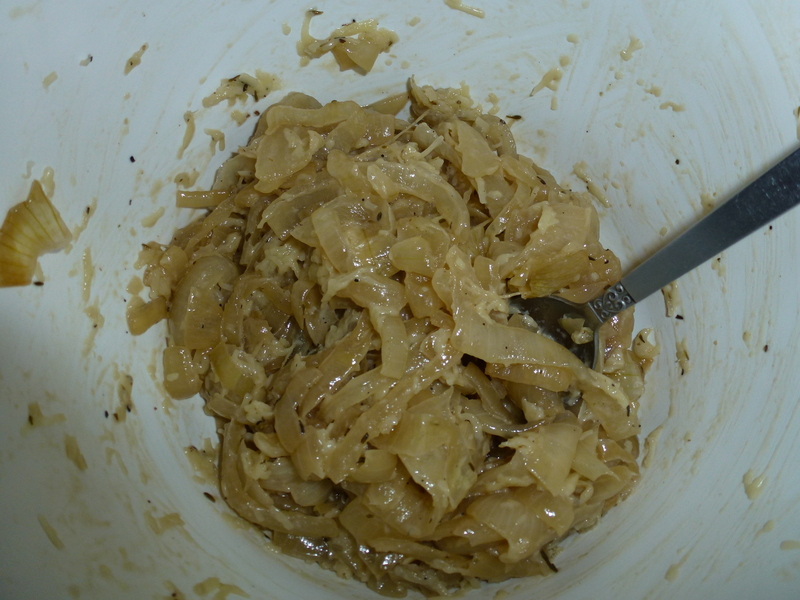 Turn off the heat and let the onions cool, then place into a bowl and mix with gruyere cheese. 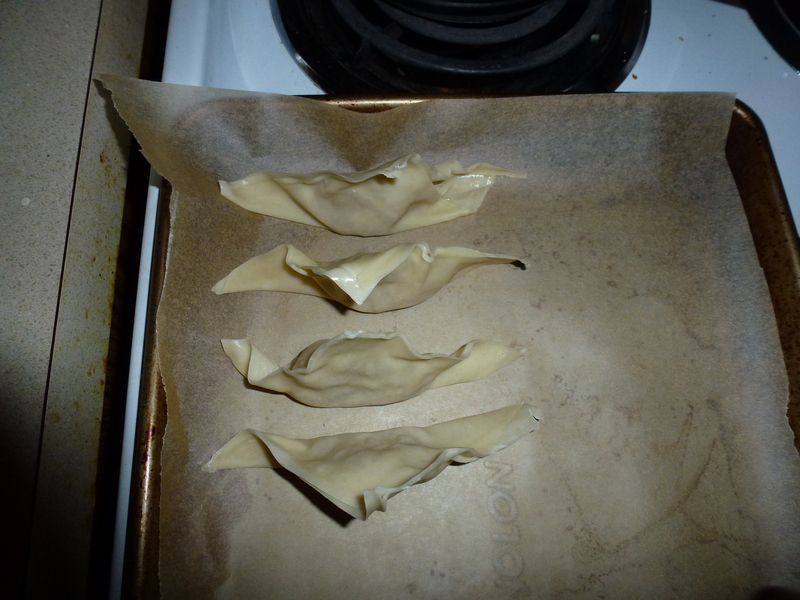 Lay 4 wonton wrappers out on a clean, dry surface, then place 1 Tablespoon onion mixture into the center of each wrapper. Wet all four sides with a pastry brush or your finger, then fold the bottom right-hand corner up the top left-hand corner and seal the edges, being careful to remove all air pockets. 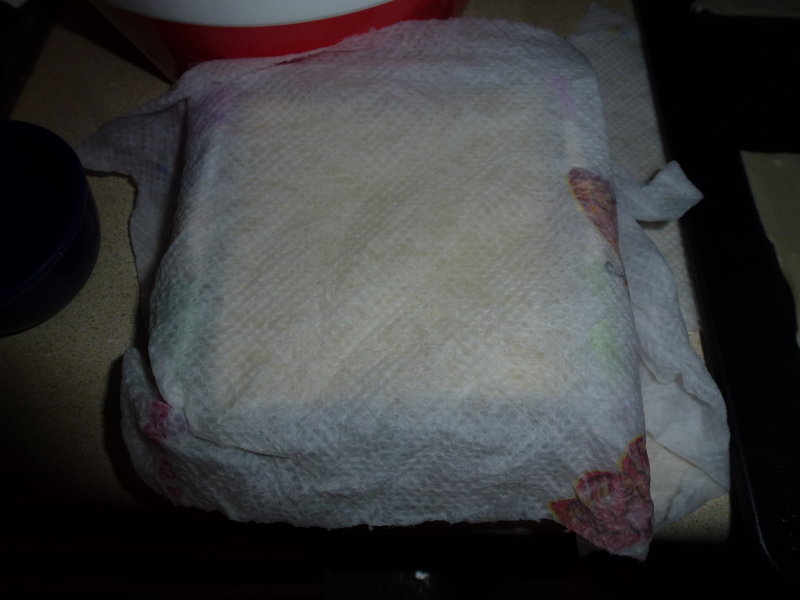 Transfer potsticker to a wax paper-lined baking sheet and press down gently to create a flat bottom. Repeat with remaining wrappers and filling. This entry was posted in Asian Inspired Food, Dinner, Lunch and tagged french onion soup, French Onion Soup Potstickers, fusion, potstickers. Bookmark the permalink. I miss Fusionland! I do remember you always ordering the chicken teriyaki burger too, haha. THis recipe looks awesome, I’m definitely going to try it. I love that you can freeze it too, that will be nice for when I get home from work and don’t want to spend an hour making something. Can’t wait for your next recipe! Thanks Val! I know, I was so sad when it closed! It was yummy and cheap. Let me know if you make these!